Former UCLA men's basketball player, Reeves Nelson, has filed a lawsuit for defamation against Sports Illustrated resulting from SI's March 2012 article entitled, Special Report: Not The UCLA Way. 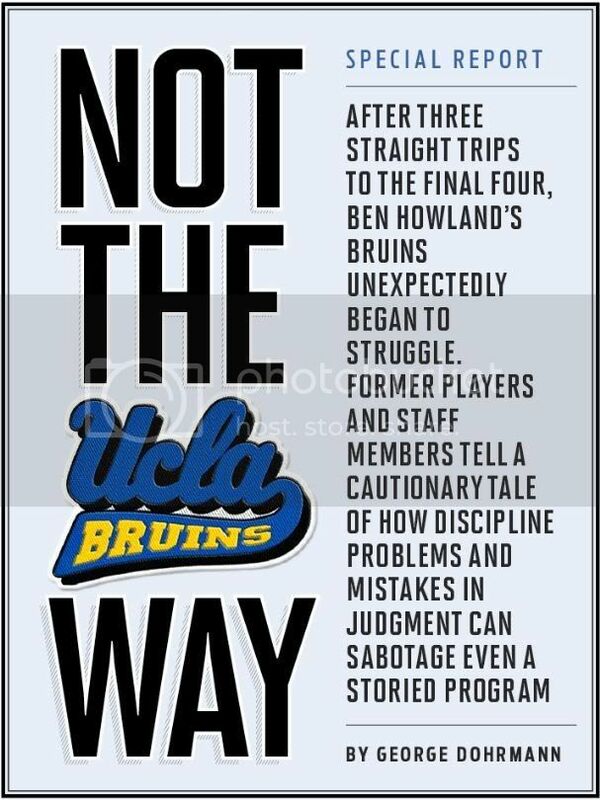 The scathing article, written by Pulitzer Prize winning author George Dohrmann (more on him later), portrayed the UCLA men's basketball team as dysfunctional and out of control, placing much of the blame on Nelson's conduct. The revelations added salt to the open wound of a UCLA hoops season that saw the Bruins finish in the middle of a weak Pacific 12 conference and miss the NCAA tournament for the second time in three seasons. Those who know me know that I am a rabid UCLA sports fan, particularly as to the UCLA men's basketball team. I have had season tickets for over 20 years, follow the team in road games around the country and am a donor to UCLA Athletics. I am in all sense of the word a UCLA basketball "booster." During the 2011-12 season, UCLA men's basketball fell far short of expectations -- suffering embarrassing losses to "lesser" basketball programs, losing by double digits to top teams and failing to earn a postseason bid which most of us consider to be UCLA's birthright. Plus, UCLA fans had to endure the indignity of having to attend most "home" games at the Los Angeles Sports Arena, an arena which cross-town rival USC abandoned years ago, while the Bruins' home arena, Pauley Pavilion, underwent major renovations. Beaten on the court and essentially homeless, the UCLA basketball team then had to face SI's blistering and embarrassing accusations just days before one of the worst seasons in UCLA basketball history was about to end. Unlike most subjects on this blog, the SI "expose" and Nelson's alleged conduct within the team detailed in that article was (and is) intensely personal. Nevertheless, as an attorney with substantial experience in defending the media as well as representing plaintiffs in defamation claims, I could not pass on the opportunity to comment on Nelson's defamation lawsuit. After the jump, you can read Nelson's complaint, and evidence he submits at the outset of his lawsuit, as well as my views on his claims. Copyright © 2019 The Avanzado Law Firm, APLC. All Rights Reserved.